"YOU JUST DID NOT WANT TO LEAVE," Diane Beck explained to me. "The home was built to take advantage of all the possible views on Jenkins Point. The interior was a soft warm inviting color and the layout made you feel comfortable and peaceful. You wanted to just sit in any room, get comfortable and look at the nature views." As Beck, a resort and real estate specialist for Disher, Hamrick & Myers, described 1405 Nancy Island Drive on Seabrook Island, my imagination drifted. I remembered a book I had been meaning to read, my grandmother-s old quilt I had been meaning to snuggle up with and the cup of tea I had been meaning to sip. And, at least for a moment, it was me, the book, the quilt and the tea on Seabrook Island, enjoying a small part of the universe that offers a vast expanse of reasons to relax. From alligators to prudent zoning, I imagined how well both Seabrook and its residents must thrive. Beck was the broker for 1405 Nancy Island Drive, a dream house immersed in nature on Jenkins Point. White oak hardwood floors and spacious rooms echo the exterior ecosystem that makes Seabrook-s scenery simply lovely and simply Lowcountry. Almost every architectural element of the house invites you to stop and smell the Confederate jasmine. From the panoramic view provided by the windows, to the front veranda, to the cabana with a back deck, Beck says, "1405 is a beautiful representation of the type of home built on Jenkins Point." The house models a mode of thought that is pervasive throughout Seabrook. "Our vision statement that we created really calls for a superior private community," says Joe Salvo, executive director of the Seabrook Island Club. "And that is really where we want to be." By "superior," Salvo means the key aspects that make Seabrook truly Seabrook. For starters, the community infrastructure of the small 2,200- acre island is supported by three entities: the town, the Property Owners Association and the Seabrook Island Club - together adding up to a trinity of tranquility providing purposeful governing and development. Salvo explains, "Seabrook-s real uniqueness is that it is the only private ocean-front community in the Charleston area. It is essentially owned by the property owners, and the island-s mandatory club membership allows the people to control their own destiny." Salvo also points out that Seabrook is one of few places with an expanding beach. Both Pelican and North Beach have accrued aesthetically, proving that a resort community can exist in harmony with its environment if management takes the time to take Mother Nature seriously, as well as thoughtfully. "Residents- concern about habitat for wildlife and green space has become a popular and very visible presence on the island," says Janice Franklin, a sales executive for Seabrook Island Real Estate who has served on the Board of Directors for the Seabrook Island Green Space Conservancy for three-and-a-half years. "We have managed, with great support of the community, to purchase seven tracts of land that will never be built on." It is perhaps the Island-s best attribute that it respects its best asset: it-s natural surrounding. The golf courses on the island have the distinguished honor of being the fi rst to be named as a "Fully Certified Audubon Cooperative Sanctuary" in South Carolina. Equally noteworthy, the Island hosts the North American Bird Watching Open, supports more than 30 species of reptiles and provides a refuge and rescue area for sea turtles. It should come as no surprise that Seabrook has been flaunting its flora and fauna for years. According to Sue Holloman and Bob Guiffreda, "The Island was inhabited by coastal Indians as early as 1400 B.C., and the ocean, forest and wildlife provided an abundant harvest of food, clothing and shelter." In 1753, Ebenezer Simmons purchased the property from Thomas Jones and cultivated indigo, rice and cotton—a crop that remained vital to this vibrant island for years after. Seabrook-s unspoiled soil continued to produce a rich history of advantageous people who collectively set the tone for the song that is sung today. Seabrook Island residents hum along to an array of amenities that include dining, tennis, golf, a marina, an equestrian center and a fitness facility. In terms of dining, Seabrook homeowners can sit down for an elegant, ocean-view lunch or dinner at the Island House Restaurant and feast on filet mignon, crab cakes and other seafood specialties. The Seaview Restaurant and Half Shell Lounge caters to a more casual clientele, and beach goers can grab a quick bite and refreshing drink at the Beach Club-s Pelican-s Nest. For those who share a love for golf, Bohicket-s Lounge overlooks the Island-s two courses and offers light lunch and dinner fare. The tennis center sports 15 composition clay courts. Serving up something for people of all ages and abilities, the Racquet Club conducts private, semi-private and group lessons and clinics, as well as the "Munchkins" clinic for young children. The tennis staff will arrange matches for players, and the full-service pro shop sells a selection of men-s and women-s apparel in addition to shoes and accessories and also offers a stringing service. Both Crooked Oaks, a 6,746-yard, par 72 course, and Ocean Winds, a 6,761-yard, par 72 course, provide outstanding views and interesting challenges. Neither is open to the public, and the resulting privacy promotes a "refreshing pace of play, replay rounds and superb service," claims the Seabrook Island Club. PGA golf professionals are available for group and or individual instruction. The Bohicket Marina accommodates yachts up to 110 feet in length and has 194 slips with electric power. Located three-and-a-half miles from the Intracoastal Waterway and the Atlantic Ocean, kayakers, motor boaters and sailors can get on the water and into the outdoors with ease and with eye-catching vistas. The Marina comes complete with a ship-s store, dining and shopping. Horseback riders can take advantage of several services, including guided trail rides, pony rides and riding lessons. 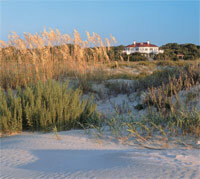 Residents may even adopt a horse to groom, feed and ride about the beach, marshes and winding trails. Athletes and heart-healthy individuals can run to the fitness center and choose from a wide selection that includes treadmills, cycle trainers, stair climbers, Cybex modular strength stations, an Olympic bench press and Olympic free weights. For a post workout treat, visitors may schedule a Swedish, sports or combination massage. With all these "superior" attributes, it is little wonder why sales continue to soar in Seabrook, from $109 million in 2004 to $163 million the following year. Greg and Samantha Ensign, agents with Atlantic Island Properties, exemplify this. "We-ve been coming here for years," Greg says, "last year, we changed our approach to life and relocated here. 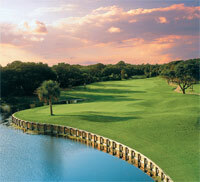 Kiawah-s nice but Seabrook has a more stately, private residential mind-set." Once again, I am reminded of my book, my quilt and my cup of tea. The thought is diffi cult to turn loose but, then again, why should I? Escaping to Seabrook Island seems to be the best way to truly appreciate life.